Fantastic experience – opening the doors for ideas to transfer back into the classroom. So useful to see how we can use the museum in a planning context. Great to find out lots about the careers within a museum. Pupils found the experience really enjoyable and for most, this was their first visit. 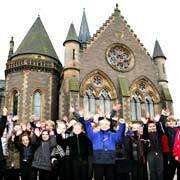 A range of opportunities are available for School groups at the McManus. We are happy to discuss the needs and interests of particular groups and encourage Teachers and Support staff to contact us in advance of visit. We advise Schools to contact us to book with a minimum of 2 weeks’ notice in advance of their preferred visit date. Please contact the Creative Learning Team with your initial inquiry at creativelearning@leisureandculturedundee.com or call us on 01382 307216. We will be happy to discuss, advise and help you plan your visit. A range of resources are available for Teachers and Group Leaders to download in advance of a visit or to support classroom learning. Our 'Educators Packs' explore objects and themes currently on display in our galleries. Most of our 'Activity Sheets' are designed to be undertaken in the galleries but some can also be used back in the classroom following a visit. To ensure that The McManus: Dundee’s Art Gallery and Museum continues to develop as an inclusive centre of learning, we work with partners to develop initiatives that meet the needs of the communities of Dundee. We welcome enquiries from Schools who would like to discuss a development project; please get in touch with the team!